Do not replace your WebInterface folder, the CrushFTP 8 WebInterface folder is very different, and replacing it with the older folder would break CrushFTP 8. 5.) 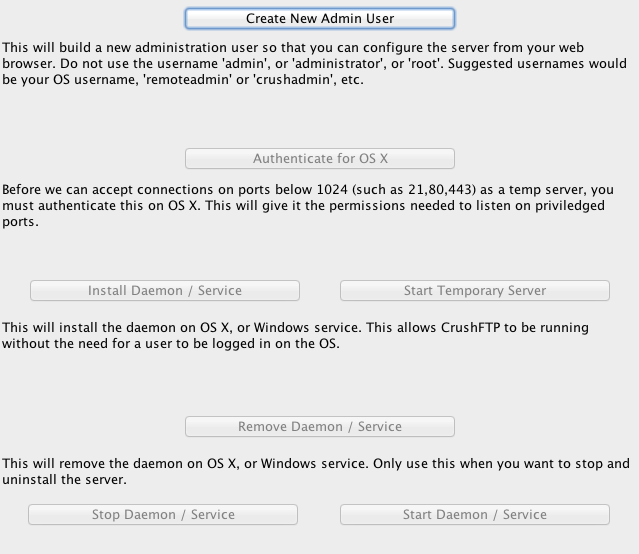 Run CrushFTP 8 as OS admin user. 8.) Login using the web browser to your server using your normal 'crushadmin' user. Go to the Admin, About tab and enter in your CrushFTP 8 license code if not registered on your prior CrushFTP version, from previous steps. Copy over any custom logo images from your WebInterface folder, but do not overwrite any login.html files as CrushFTP 8 is different. If you want your statistics for reporting to transfer over from v6/v7 to v8, then copy the statsDB folder too. Optional: If you want your statistics for reporting to transfer over from v6/v7 to v8, then copy the statsDB folder too.